URight TD3128 is an extremely simple to use blood pressure monitor: put the cuff around the arm and press start to take a reading. The result is shown on the large LCD display. URight TD3128 takes blood pressure while inflating the cuff which makes it a more comfortable and faster test. The device can be linked to the PC for data-analysis. The TenSoft software can be used to transmit the test results to the WiPaM telemedicine platform. URight TD3128 can be used simultaneously by 4 people, each with his own memory slot in the device. 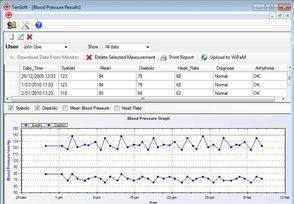 Tensoft, the software for the URight TD3128, permits to upload blood pressure results to the secured WiPaM telemedicine platform so they can be consulted by a physician.